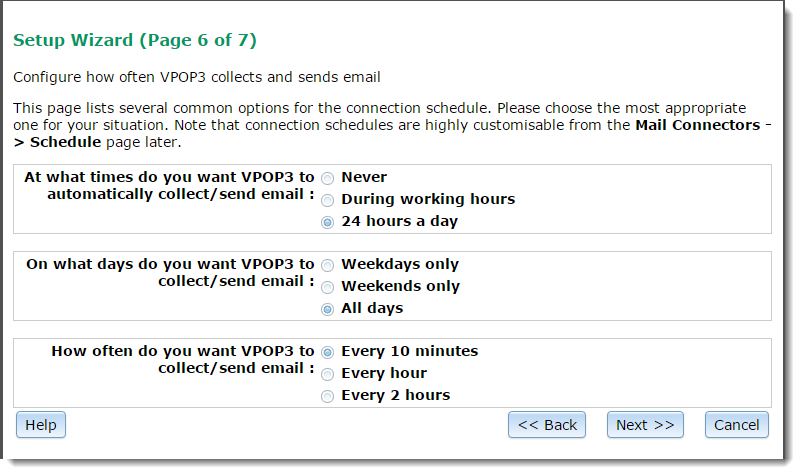 This page lets you tell VPOP3 how often to check for mail from external POP3/ODMR accounts, how often to send mail out, and how often to check for spamfilter or antivirus updates if you are using those options. You can choose a standard 'template' of how often, and when VPOP3 should 'poll' for messages. If you have a permanently-on Internet connection then you should probably choose 24 hours a day - All days - Every 10 minutes. Note that you can change these settings later, with more options, in the Mail Connectors -> Connector Schedule page later.